The day has arrived, a new Windows Phone device has been made available to purchase on T-Mobile’s online store. Nokia’s Lumia 635 is the mid-range smartphone, designed to replace the older (and cheaper) Lumia 521, and it’s the first device shipped by T-Mo to come pre-loaded with Windows Phone 8.1. From today, you can buy the Lumia 635 from T-Mobile.com for a full retail price of $168, almost $40 more than it costs when you pre-order it direct from Microsoft. As with every phone, you can get it for $0 down and pay monthly installments over 24 months, setting you back just $7 per month. All in all, it doesn’t seem like a terrible phone, and it’s not at all expensive. If you’re a Windows Phone fan on a budget, it could be worth picking one up. As revealed previously, it will be available in stores very soon, and available from Metro PCS for just $99 afterwards. Let us know if your planning on investing in Microsoft’s latest device. Surely HSN will have some sub-$100 deals around the corner. My busted Lumia 920 is sad, gave the 521 to my mom, and the Nexus 5 I’m currently using has some really annoying nuances I haven’t been able to get over since I picked it up two months ago. I totally agree. When the Lumia 521 came out, it started at $130 and everyone was pretty crazy about that. I bet the price of the 635 drops pretty quickly. Nokia’s strategy seems to be to create a high sticker price and then massively discount to impress the budget shoppers. I’m betting sub-100 within a month or two. Actually when the lumia 521 first came put the price was $149.99. I know because I bought the lumia 521 for a family member when it first came out. Poor Microsoft on mobile. There is no point now if you are soo far behind. Even a rocket ship will not take you to the front. Because everyone needs to be shepherded into one of two platforms. Don’t let the slickdeal trolls feed you the BS. There’s no way this is a mid-range device. 512mb RAM is a good reason to say it’s a low-end phone. Quadcore is useless with such little RAM. I would tend to say low end honestly. 512MB is horrendous. I’m sure it’ll be pretty good. I mean look at the 521. I owned it before my 925. In my opinion, it was better than some of the more expensive phones. You can’t always just go on specs alone. I ordered one from HSN for $120 but they aren’t delivering it until 7/21 which is sad. Why does it takes 2 weeks for them to ship it? Amazon delivers the same day now for measly $5.99. I have a feeling the phone isn’t yet truly available. Maybe these are just pre-orders no matter where you order it from? That’s possible, at least they should inform you. mine too. They are still in preorder. A couple of months ago, HSN was advertising the Lumia 925 at $199. I ordered it. Initial indications were that the order went thru. Waited a week to determine when the phone would be shipped. Only after a week did HSN inform me that the phone wasn’t available. First and only time I have ordered from HSN. Also the last time. This wouldn’t be a bad backup phone….. I don’t dislike it as much as I initially did when it was announced, but it does irk me that it only has 512MB of RAM and no FFC. I’ve been considering getting one for my mother to replace her 620 (although she’s fine continuing to use that). I’m sure the price will come down after a couple of months. $168 isn’t bad at all, though. I think the 635’s battery is 1830 mAh if I’m not mistaken?? That’s about on par with the 810’s, although of course that has a slightly smaller screen. I really like that the 635 can handle 128GB SD cards. WP is great for first time smartphone users, useless for just about everyone else. Not enough great apps/games and Bing services just doesn’t cut it. Here Maps still lists closed down stores near me. WP has less than 10% marketshare worldwide, I think I speak for just about everyone. Hey its their right to like an under evolved platform. If everyone in the world were advanced and agreed with you, how could you feel superior and Douchy? And, look who’s taking the time to go out of their way to comment on an article about a phone used by grandmothers. I guess your darling superior platform doesn’t complete you? You would think you’d have something better to do than make remarks about an OS you don’t like. Guess not, huh? Wait. I get it… you’re using your superior platform as the ultimate trolling tool. Beautiful. You have single-handedly won the smart phone wars. I’m convinced. Everybody convert now. Any OS that’s not what S. Ali uses is wrong. And, you will burn in hell for all eternity for choosing otherwise. That’s funny because I run a business and it’s the only phone that gets me through the day. By the way google maps still lists places that are closed as well. Pretty sure you will find that on any map. Here maps is the best nav I’ve ever used especially offline maps during traveling. I find the other two os’s useful for games and that’s about it. Must be a terrible business then because no self-respecting organization would use WP platform for any serious work. For heavens sake, you couldn’t even use VPN until 8.1, you still use a non-standard browser (IE), and you can’t even get an official YouTube app. I won’t even get into how developer unfriendly WP is. What does a business need with a YouTube app? IE is such a “non-standard” browser that it’s used by more people than any other browser. And I dunno what a business user needs an “official YouTube app” for, especially when the Windows Phone app MetroTube is vastly superior to the spyware-infested “official” Google offerings for Android and iOS. (I prefer to keep my usernames and passwords for my online banking and key business systems private, and not share them with Google, thanks). Am I supposed to believe a jackball who makes sweeping statements without backing them up? I’m not a first-time smartphone user. Among the smartphones I’m currently using now is the Blackberry Z10. I’ve run the developers’ version of WP 8.1 on a Lumia 521 and have been favorably impressed by WP 8.1. On a phone with better hardware, the hardware/software combination should be extremely impressive. Most reviews of WP 8.1 by reviewers who have expertise and actually spent more than a little time with the OS have been positive, including a recent review in PC Magazine. Good for you. I’m sure the few of you out there in the WP fan club are thrilled. The rest of us on the real world are using a superior platform. Deal with it. WP was built for the smartphone illiterate. Its the kind of phone my mother or grandmother would use. Lol. I got it for my mom precisely because of that. Lumia 521 for $125 just right. Android complicated? LMAO, okay then. I’ve only got one Android phone to my name, but it’s anything but complicated. I’m curious — which part is “superior?” Is it the part where Android malware causes your phone to run hot and burn through your data allotment in two days when your phone is transformed into a hub to send spam, is it the part where the battery konks out in the early afternoon, is it the part where “Unfortunately, *App* has crashed,” or is it the part where Android handset users don’t get the latest update on their eight month old phone and are forced to either download a dodgy hacked ROM with malware or “trade in” for the latest gimmicky device for a lot of money? microsoft announced ‘first 2 weeks of July” so any day now hopefully. Ordered one on hsn for $119 with accessories for my daughter’s birthday. It will get here two days before. 4 payments and I’m done. just to let you all know. you can also get it from hsn with a portable charger for 120 and split it into four payments. The only bad thing about this phone is the same for for the 521,no flash for the camera. Come Nokia stop being cheap with your mid level phones. Even Sammy put a flash on there mid level phones. How much more would it cost? $5-$10. more per phone? Heck on the last flip you guys made for Tmo had a flash on it,the 7510. None on these? Really? This is an entry level phone. A mid level phone would have the 8xx number. The 925 is an upper level phone but not a flagship phone and T-mobile has yet to offer a flagship windows phone. lets not forget the 710 also had a flash, that phone mid to entry level. So why not this this one? The 710 / 720 is more of a midlevel phone and costs close to $300. I bought mine from T-mobile at the subsidy price of $250 when it first came out. So far entry level Lumias are in the below $200 category. Hmm…it depends. Spec-wise 710 was the lowest WP on TMO network at the time. I got mine as a free upgrade at $0. It was offered for free to many customers(new and upgrade) at the time with a 2 year contract or renewal. Way back in the day, I bought from T-Mobile (and still use) an HTC 8X. It was touted as a flagship Windows Phone, but, alas, HTC released it and kicked it to the curb. Still a great phone…but I’m waiting for a great “flagship” successor to that on T-Mobile (though I don’t expect it from HTC this time around). I really liked what HTC did with the 8X. I chose the Lumia 710 instead since the promise of Nokia having exclusive access to WP swayed my decision at the time. Shame that T-mobile decided to abandon both phones and blocked any chance of offering the official 7.8 update. Anyone have an official link for the lte bands supported on TMO? I am looking at this for my next JUMP. I am really wanting a Lumia 920 as Tmobile will sell it to me refurbished for $151 but I can not JUMP to a refurb only a “new” phone. 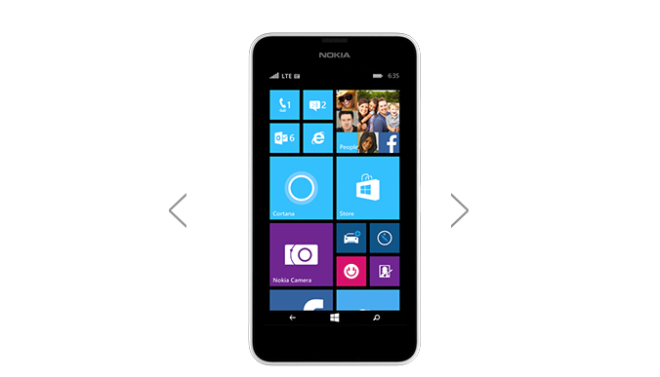 Then I would give the new Lumia 635 to my wife and buy myself the 920. I may just stop JUMP. Yeah I dropped jump. It’s useless for people who use Windows phone. I just save my nickels and buy international or ATT unlocked after the device I want has been out for a month or two. Using the 1020 right now. The 1020 is a great choice. I ordered mine from HSN, $119 is a good price. Even the Alcatel Fierce may be more useful. For an entry level WP phone, 521 is still unbeatable at $60. It just came out so prices are sure to drop. I’d spend the extra money just to get the better display and lte. The 521 display is an eyesore and a smudge magnet. I compared the 521 side by side with an Optimus F6 in a TMO store and decided to go with the F6 due to the display. However, the F6 has 960×540 display and a front camera on sale at $99 for quite some time, the 635 has only 854×480 display. I can’t see how it would look better than the F6. The 925 is certainly better but it’s in the $200 price range instead of $50-$100. With NFC, a $50 credit can offset the $99 making the F6 a $49 phone. IMO the best value among all TMO phones. I loved Nokia 710 and it was a very solid offering at the time, 521 is also quite good at $60. To me the 635 is quite disappointing and may have a hard time against competition. They should at least offer a low-end VGA grade front camera. That would have made a positive difference with marginal costs. I’ve been very surprised with how good the 635 has been. Oddly enough one big reason is the speaker quality, something usually not commented on in reviews. but this thing is inexpensive and good quality otherwise.